Need more room in your home and live on a big lot in Portland, Oregon? Consider this: build a Backyard Cottage or an "ADU" (Accessory Dwelling Unit). Backyard Cottages are detached accessory dwelling units, a separate dwelling on the same lot as a primary residence in a residential zone. In Portland, they can be built to be up to 800 sq. ft in size - depending on the zoning codes, height and location. 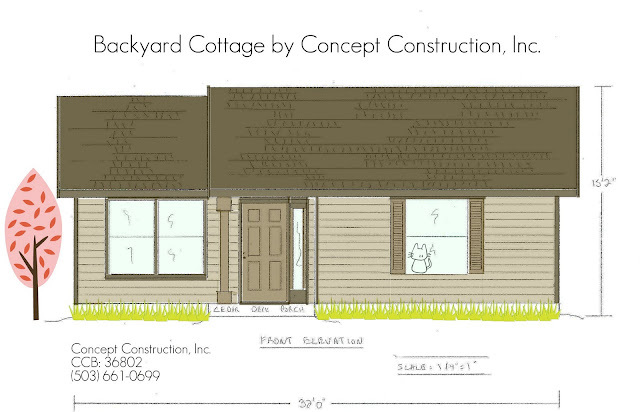 Backyard Cottages are growing more popular to build since the City of Portland has temporarily waived expensive SDC fee's. The small houses provide: separate (but close) living opportunities for families, increased value to your home, and affordability. * Maximum 800 Sq Ft.